Location: The entrance to Lloyd Harbor and Huntington Harbor. Original light: 2 story white wood frame structure with 11 rooms, an attic and an offset white brick light tower, brick foundation. Fifth Order Fresnel lens with fixed white light. Present light: 42 feet; Flashing white light every six seconds (original light was fixed red Fifth Order); light was originally kerosene, then electric; concrete structure; reinforced concrete crib foundation was constructed onshore, then towed to site and sunk and filled with concrete; Built by the Charles Meade Co. of New York. 1854: $4000 appropriated for lighthouse on Lloyd's Neck. 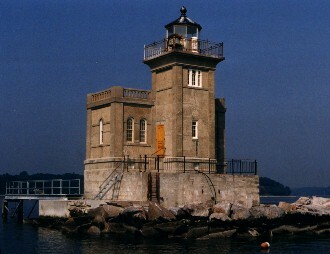 1857: Original light constructed on southern tip of Lloyd's Neck. This light's purpose was to help ships find refuge in Lloyd Harbor, which is adjacent to Huntington Harbor. 1857, November 15: Light illuminated. 1905: Huntington residents submit a petition requesting a lighthouse at the entrance to Huntington Harbor. 1910-1912: Present light built at the entrance to Huntington Harbor. 1924: State of New York obtains original light and property. 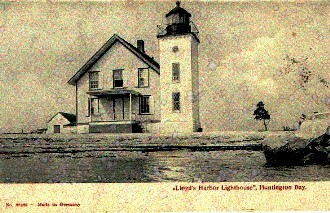 1928: Town of Huntington gains control of original light. 1947, November 12: Wooden structure of original light destroyed by fire. Article in the Nov 13th Long Islander states "[i]t is believed that hunters had occupied the building Tuesday night and through carelessness in having a fire inside one of the old fireplaces caused the blaze." 1984: Federal government decides to demolish the 1912 light, causing the formation of Save Huntington's Lighthouse, Inc.
1986: Coast Guard removed collapsed roof. 1989: Light listed on the National Register of Historic Places. 1997: New steel dock installed by Coast Guard. 1998, July 2. The Save Huntington Lighthouse Board of Directors meets. It is the first meeting at the light itself. Current use: Active aid to navigation. Future plans are for a museum in the lighthouse. The surrounding area: Eaton's Neck lighthouse is nearby. There are two nice parks on Lloyd Neck, as are the remains of the original lighthouse. Public access? Tours are conducted May through October. Contact the Huntington Lighthouse Preservation Society for more information. Other information: First keeper of original light was Abiatha Johnson. Funds are currently being raised to renovate the 1912 structure's interior.